You know, I think the 2003 calendar looks much better. Really Nice! If Flay wasn't in the wall I don't like her at all. good job man nice work and keeep up teh great work XD the pictures looks good hahahah mad props for you!! =3 that's a nice group scan. thanks for sharing. tollie actually doesnt look like an extra for once. Wow! This pic reminds me of my friends back in high school, especially Flay. She resembles my very manipulative best friend --> yeah I like her so much yet it seems that we are just so vulnerable to manipulations no matter how strong we are. Very nice picture of the group! They seems all happy on this one. 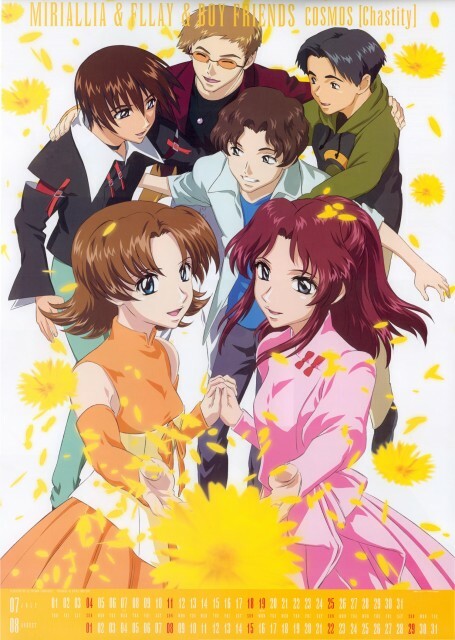 ^^ That is a very nice picture of Kira and his friends. I think Flay and Miriallia look very pretty there, and with those dandielions (or am I wrong?) around them. :) And it is also cool to see Kira, Sai, Kuzzey, and Tolle there too. ^_^ Nice picture. Miriallia-san and Fllay-san are kawaii here and the boys look nice. I missed this group of friends so badly. I like Fllay too. *sigh* What a nice scan! aww, the students from Heliopolis... so rare to see a pic of them together. thanks for sharing!